The next time you climb with us, you will not only be enjoying the climbing, you will be helping to protect it as well. Alpine Endeavors regularly donates time, funds and programs to local organizations to help their cause, the climbing areas we are fortunate to have, and the planet. 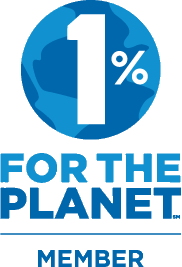 We are a member of 1% for the Planet, an organization that's purpose is to help grass-roots, earth-friendly organizations protect the planet we all love. As a member, Alpine Endeavors has pledged 1% of its gross sales to the preservation and restoration of the natural environment through special contributions to approved environmental nonprofit organizations. We provide support through membership and special contributions to the: Mohonk Preserve, Friends of the Shawangunks, Gunks Climber Coalition, Access Fund, Catskill Center for Research and Development, Leave No Trace, Stone Mountain Farm, and others. Over the years, we have donated numerous gift certificates to local schools, universities, environmental organizations, and local community members to their benefit auctions such as: SUNY New Paltz, New Paltz Athletic Association, High Meadows School, WVIA talk radio, Kaleidoscope of Hope, Poughkeepsie Gymnastics, The Nature Conservancy, Tom Spiegler Benefit Auctions, the Mohonk Preserve, and others. Each year since 2003, we have donated time and resources to the local NYS DEC rangers to work on evacuation strategies and yearly rescue training at the various ice climbing areas in the region. This gathering has now become a yearly training with all the guide services who provide ice climbing in the area. We have donated free advertising space in our publications: An Ice Climber's Guide to the Catskill Mountains, and A Climber's Guide to Peterskill (arriving in summer 2009), to the: Access Fund, American Mountain Guides Association, Catskill Center for Research and Development, Leave No Trace, and others. If you would like to help out the organizations mentioned, please visit our Friends page for a complete list with links to each organization. If you have an event or organization you feel we could assist with our services, please send all information to info@alpineendeavors.com for us to review and someone will contact you. December 30, 2011 - Alpine Endeavors raised $1,300 from our annual Ebay auction held to help the Mohonk Preserve Rescue Fund. December 30, 2010- Alpine Endeavors raised $1,000 from our Ebay auction held to help the Mohonk Preserve Rescue Fund. Alpine Endeavors raised $800 (toward the $20,000 goal) for ovarian cancer at the Kaleidoscope of Hope Annual Dinner, held at the Westin Governor Morris Hotel in Morristown, NJ. Alpine Endeavors raised $250 from an Ebay auction held to help the Mohonk Preserve Rescue Fund. 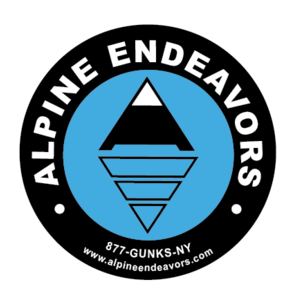 Alpine Endeavors raised $900 from an Ebay auction held to help the Mohonk Preserve Rescue Fund after vandals stole all their rescue equipment on October 11, 2008.